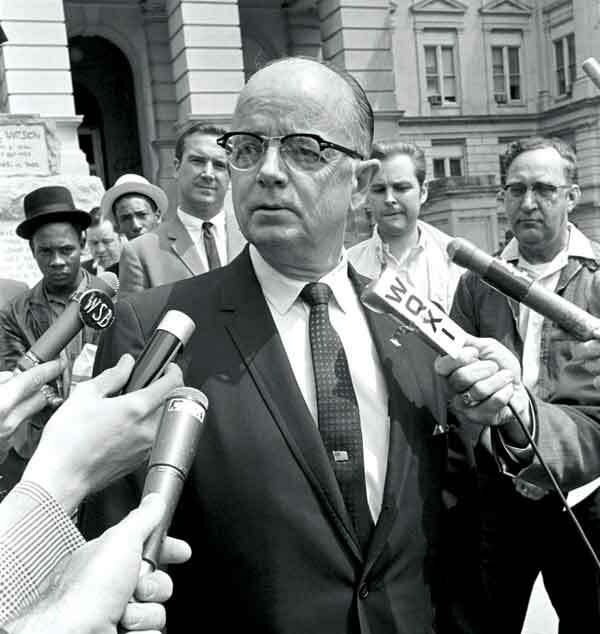 In the Georgia Gubernatorial Election of November 1966, Lester Maddox rode a wave of resentment over the advancement of the civil rights movement and finished in a virtual tie with Republican millionaire Bo Callaway. Neither candidate won a majority due to former Governor Ellis Arnall’s third-party candidacy. After some wrangling in the courts, the Democrat-controlled Georgia legislature selected Maddox as the winner in the “three governors” incident. Lacking political connections and a campaign infrastructure, Maddox simply outworked the competition. He covered the state in his Pontiac station wagon, shaking hands and distributing American flags, bumper stickers, and bubble gum to enthusiastic supporters. Maddox was a seasoned campaigner (he’d run unsuccessfully three times before), yet he boasted of his political inexperience: “God,” he said, was his campaign manager. Actually, it was his brother, Wesley. Maddox’s opponent in the general election was textile heir Bo Callaway, a recent Republican convert in the mold of Barry Goldwater. The two conservative candidates ran neck and neck. Disenchanted liberals backed Arnall as a write-in candidate, which threw the election into the hands of Maddox’s Democratic allies in the legislature. Many Georgians were horrified that the pistol-waving eccentric who chased away black ministers from his segregated chicken restaurant, the Pickrick, could become governor. His election also worried Atlanta’s business elite. But Maddox’s rural, blue-collar supporters were elated. Maddox’s unlikely candidacy hinged on a number of factors, but what swept him into office (for only one term) was the electorate’s unease with the pace of integration and his own folksy charm as champion of the little guy. His racial demagoguery overshadowed his conservative stance on moral values and government intrusion into private enterprise, two issues that have dominated national politics in the decades since.